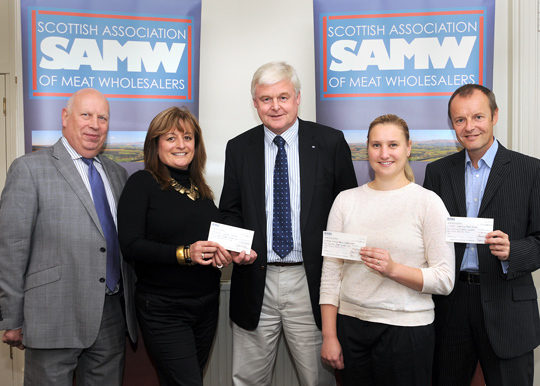 The children’s charity, NSPCC Scotland; Chest Heart & Stroke Scotland; and the cancer care organisation, Maggie’s Centres, have each been given £1,750 by the Scottish Association of Meat Wholesalers (SAMW). SAMW members and supporters raised a total of £5,250 during a charity auction at the Association’s annual conference and dinner in Glasgow earlier this year, enabling the individual donations to be presented to the chosen organisations. “This is a long-standing SAMW tradition and we’re delighted to be able to once again make a contribution to the work of three such important charities,” said Association president, Alan McNaughton. (Left to right) Ian Anderson, SAMW executive manager; Valerie Busher, community development manager for Scotland, Maggie’s Centres; Alan McNaughton, SAMW president; Susie Barron, community fundraising manager for NSPCC Scotland, and George Grierson, corporate development manager, Chest Heart & Stroke Scotland.